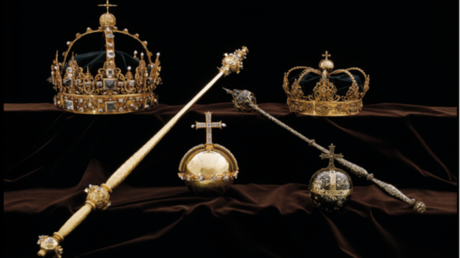 Swedish police have mobilized its land, sea and air forces to catch two men who stole two 17th century royal crowns and an orb from a church in broad daylight on Tuesday before making a daring escape in a motor boat. In what looks more like a Hollywood movie plot than real-word crime news, crowns belonging to two 17th-century members of the Swedish Royal family – King Karl (Charles) IX and Queen Kristina (Christina) – were stolen by two perpetrators as they raided a church in the country’s southeast. The burglars also took a royal orb, a traditional symbol of monarchical power in the form of an orb surmounted by a cross. Police say the burgled regalia are “invaluable objects of national interest” and cannot be given a price tag. Having taken the national treasures on Tuesday afternoon, with the staff present in the church, the perpetrators promptly jumped into a small motor boat moored below the church and made away with the loot. They are still on the run despite a wide-ranging police hunt for them. The crowns and the orb were reportedly exhibited in locked glass cases, which ultimately proved no match for the two thieves. Queen Kristina, who ruled Sweden from 1632 to 1654, and Karl IX, the King of Sweden in 1604-1611, were buried wearing the now-stolen crowns, but the regalia were later put on display for churchgoers. There is even no definitive description of what the thieves’ “small and open motorboat,” which the police are searching for, looks like. “We have some different information about how exactly the boat looked. We are now examining all the tips we receive,” Agnevik said, as cited by the Daily Mail. Police believe that the perpetrators might have abandoned the motorboat, changed into a car and are either going west, or east towards the capital Stockholm. Since it’s unclear what road the suspects could have possibly taken, the police seek to cover all escape routes. “We are spreading out in all directions,” Agnevik told The Sydney Morning Herald.